With the baseball bat, I could see Homestar being Ness as you said. I rather thought Marzipan might be John Lennon. The Cheat looks like some sort of grandma character with curly hair and glasses. That one is interesting. His hair is a bit more afro-like in my opinion, but it does seem like Strong Mad ought to dress as a martial artist sometime. The idea of one of the characters dressing as something else that either of TBC worked for is interesting, I hope you're right about that one. My cultural literacy is reeeeally bad... I'm not able to guess, suggest, or recognize costumes, sorry. 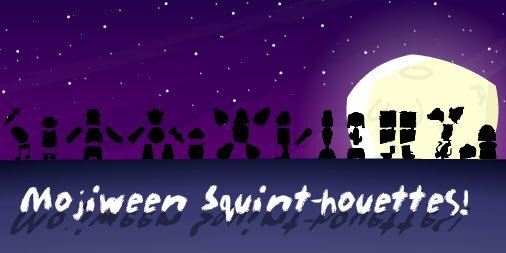 There is a squintmoji variation image uploaded a little while ago. Hopefully we can figure out what the other costumes are. So I do know the costumes of the following characters: , , , , and . If anyone's seen one of DaBurninator's pieces, you'll see he'd predicted Coach Z's costume. What are the odds? Clearly, Homestar has to be someone with a PROPELLER cap. And for some strange reason, that object he's holding looks blurred. If I had to guess what Strong Bad's actual costume was going to be (we all know it won't be Ridley in the Halloween toon), I would expect Lord Hater from Wander Over Yonder. Believe it or else, Matt was involved in The Bounty and The Time Bomb and Mike was involved in The Liar. You might be asking, "Why Lord Hater?" Isn't it obvious? Red color, green eyes, gruff voice, interest in ladies, you get the idea. Besides, it could form a nod to what Disney XD show is superior between Strong Bad and Bubs. Also, saveWOY, because a third season was lovingly planned out, but it got denied before the second season premiered. I wonder if not regular characters will be dressed up this year. Actually I think that one is pretty good.